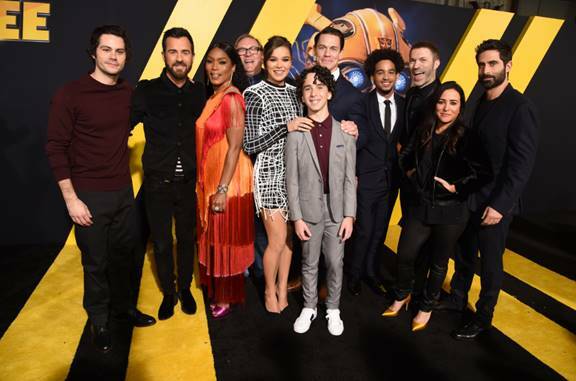 Paramount Pictures presents the global premiere of Bumblebee with appearances by cast and filmmakers at TCL Chinese Theater on December 9, 2018, in Hollywood, CA. The film takes place in the year 1987, where, on the run, Bumblebee finds refuge in a junkyard in a small Californian beach town. Charlie (Hailee Steinfeld), on the cusp of turning 18 and trying to find her place in the world, discovers Bumblebee, battle-scarred and broken. When Charlie revives him, she quickly learns this is no ordinary, yellow VW bug. In addition to Steinfeld, the film also stars John Cena, Jorge Lendeborg Jr., John Ortiz, Jason Drucker, Pamela Adlon, and Stephen Schneider. I can’t wait to see this movie. It’s cute and touching movie. Angela Bassett is always pretty. Renee Schumer and 5 others upvoted this.